The imposing building owned by Al Baraka Banking Group comprises two blocks, linked together by a bridge over a “plaza” that is a thoroughly modern take on the historic courtyards of traditional Bahraini homes, a public area in which all users of the space can meet and share. 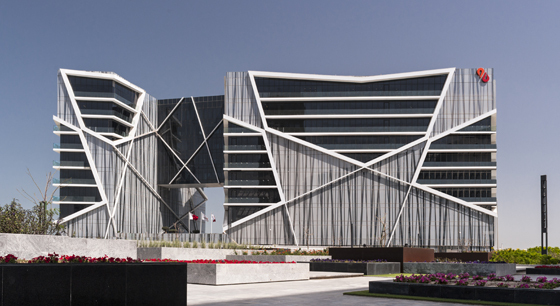 For the design of Al Baraka Bank, one of the major Islamic banks, studio EMGA drew inspiration from the geometries of Islamic patterns, deconstructed and enlarged so as to form the outer skin and structure of the building. The diagonals and horizontal levels give the elevations of the building a unique visual character, and in addition to their aesthetic role, they also form the backbone of the structure itself. The structural integrity of the building lies within these components, reinforcing the concept of a building that wears its skin on the outside and its skeleton on the inside. The lines create a strong personality that captivates passers-by, but also guarantees a setting that is both prestigious and comfortable for those visiting or working inside it; the geometric lines also burst forth in the interiors, in the patterns of the glass, the receptions, the ceilings, the carpets and the multi-purpose auditorium. Fantoni chose to echo these designs in the custom-made storage furniture, a revisitation of a collection featuring distinctive milled patterns on the MDF doors. The interior design, developed together with the Fantoni Research Centre, ticked all the required boxes for a working space that would be stimulating, modern, dynamic and contemporary. The green areas challenge the monotony of a classic bank interior, bringing the outside in, and creating a dialogue between the blue of the ocean and the warm colours of the interiors. Both buildings are nine-storeys-high, and the layout of a “typical floor” includes both open-plan spaces and cubicle systems. Floors 1 to 6 feature an open layout, intended to stimulate idea sharing and work efficiency. On these floors the workstations are designed to offer absolute flexibility; a successful workstation is organic, with the capacity to adapt to workers' needs, and indeed, these are custom made, easy to move and rearrange in line with organisational needs. Given the still-strong demand for privacy in these markets and the need for acoustic comfort due to the presence of numerous glass surfaces causing reverberation, the designer opted for the use of 4akustik sound absorbent panels, which became a structural part of the cubicles themselves, and of the partitions in areas of high foot traffic, as well as in the meeting and multi-purpose rooms. The third – clerical and administrative – floor is equipped with a multimedia room, a training room and a library with custom-made bookcases, highlighting the attention to every single design aspect, such as the corporate colours featured in the choice of seating on the clerical and administrative floors and in many other architectural details. 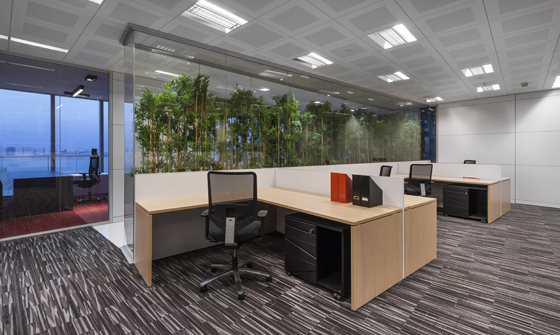 The Fantoni glass partitions enhance the privacy of the executive floors while maintaining a sense of openness and brightness. The spaces are never divided at right-angles, instead featuring a range of variations and angles that present a veritable challenge for the design of the partitions. Here the details grow even more elegant, privacy more defined, the colours richer, the materials more luxurious, and selected from among the world's most prestigious producers. 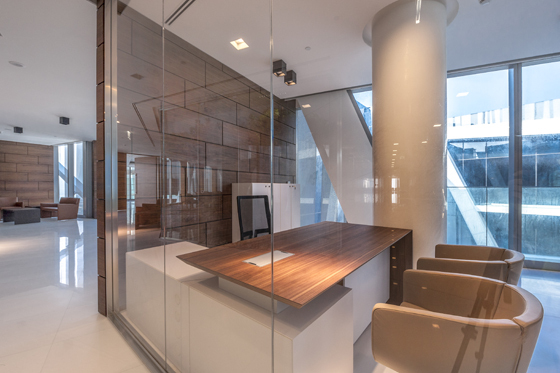 This was a great challenge for Fantoni, a complete project involving the integrated development of the furniture, walls – both in glass and melamine – and the sound absorbent systems. Undoubtedly the fact that the group includes a company specialising in the production of laminates and melamine papers was an advantage, enabling Fantoni to respond to the requirements for a uniform finish in the materials supplied, and thus meeting the demands of both the client and the architect. 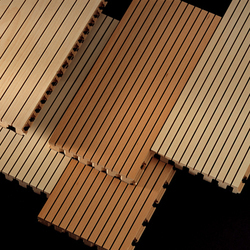 The company's collaboration with studio EMGA is a long-standing one, making for great synergy and unity of purpose.